Rhode Island Boundaries was first issued in 1936 as a special report of the Rhode Island State Planning Board. The maps were designed by John H. Cady and drawn by William A. Perry, a staff artist of the planning board. We use the first two maps from the book that coincide with the timeline of Roger Williams’s life, adding dynamic color elements to show the sequence of the county, town, and colonial boundaries of Rhode Island and Providence Plantations as they were developed from the first settlement by Roger Williams in 1636 to 1703. Our text in the year-by-year section is based upon the research in Rhode Island Boundaries, although several spellings and dates have been corrected. Providence was settled in 1636 by Roger Williams on land which he secured by verbal transfer from Canonicus and Miantonomi, chief sachems of the Narragansetts, and which was described as "the lands and meadows upon the two fresh rivers called Moshassuck and Woonasquatucket. Roger Williams and John Winthrop purchased Prudence and Patience islands. Shortly after, Roger Williams purchased Hope island. Portsmouth (as it was later named) was settled in 1638 by Anne Hutchinson and William Coddington, who purchased the island of Aquidneck (the name of which was changed in 1644 to Rhode Island) form the Indians and laid the foundation of the new town at Pocasset, near the north end of the island. In 1639 another settlement was made at the south end of Aquidneck island at Newport, by seceders from Pocasset. A trading post was established at Cocumscussoc, on Narragansett Bay in 1639. The division line between Portsmouth and Newport was established in 1640. Miantonomi, about the year 1642, established more specific bounds for the 1637 Providence deed as follows: Sugar Loaf Hill, Bewit’s Brow, Observation Rock, Absolute Swamp, Ox-ford, and Hipses Rock. Those bounds cannot now be accurately determined. Sugar Loaf Hill was doubtless north-west of Pawtucket, and possibly at Lonsdale; Bewit’s Brow was somewhere on the west side of Moshassuck River; Observation Rock was probably in the town of Lincoln; Absolute Swamp may have been in Wanskuck; Ox-ford was probably on the Woonasquatucket River; and Hipses Rock was undoubtedly a high rock west of Neutaconkanut Hill. In 1642 Warwick was settled by Samuel Gorton who, with eleven companions, purchased Shawomet, the territory bounded on the east by the waters from Sowhomes Bay (Occupasspawtuxet Cove) to Shawhomett Neck (Warwick Neck), and extending westward twenty miles. In the same year John Greene purchased a tract at Occupasspawtuxet, north of the cove. Warwick was called Shawomet until 1648. The colony was disrupted, Newport being governed by Coddington, and Providence and Warwick continuing as Providence Plantations. With the revoking of Coddington’s Commission in 1654, however, the colony was reunited. 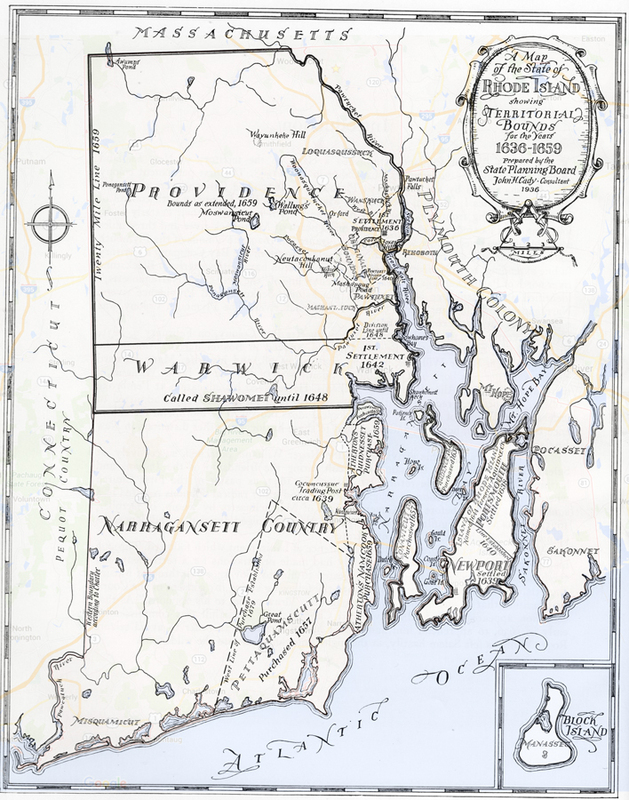 The territory south of Warwick to the ocean was known as the Narragansett Country, and was claimed by both Rhode Island and Connecticut. A tract known as Pettaquamscutt, extending to the ocean, was purchased in 1657. Gould island was purchased by Thomas Gould. Conanicut island was purchased by William Coddington and Benedict Arnold in 1657. Dutch, Goat, and Coaster’s Harbor islands were purchased by Benedict Arnold in 1658. The territory of Providence was extended to include all of the present Providence County west of the Blackstone River, with the west bound “twenty miles west of Foxes Hill,” by conveyance on the part of Cojonoquant, successor to Miantonomi, in 1659, and by deeds to the town from certain other Indians. Potowomut Neck, south of Greenwich Bay, and Nanequoxet, in North Kingstown, were purchased in 1659. Fox island was purchased by Randall Holden and Samuel Gorton in 1659. The territory of Rhode Island colony in 1659 included the towns of Providence, Warwick, Newport and Portsmouth; eight islands in addition to Rhode Island, in Narragansett Bay; and the Narragansett Country, the latter claimed also by Connecticut. Conneticut claimed all territory south of Warwick, east to the "Narragansett River" under its royal charter. In 1663 Charles II granted a new charter to "The Governance and Company of the English Colony of Rhode Island and Providence Plantations in New England in America." The overlapping of the east and west bounds of the colony defined by this charter, upon those established by the Plymouth patent of 1629 and the Connecticut charter of 1662 respectively, caused disputes which continued for many years before adjustments were made. 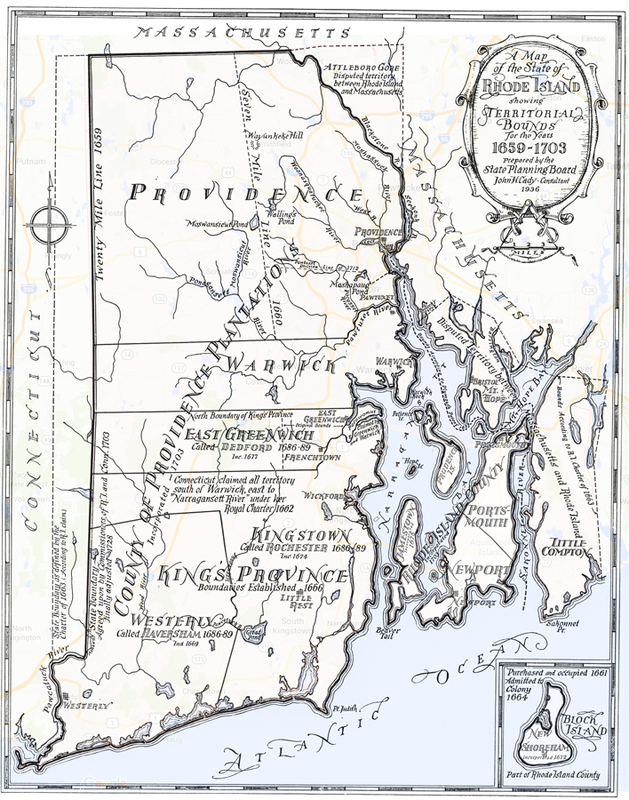 The Plymouth territory, under its patent, extended westerly to include "one-half of the River called Narragansetts," interpreted to mean Narragansett Bay. Included in the overlapping bounds were the present towns of Cumberland, Barrington, Warren, Bristol, Tiverton, and Little Compton. Block Island admitted to the colony. After continued disputes with Connecticut, a Board of Commissioners of the two colonies in 1703 upheld the decision made by the Arbitrators in 1663 and established the bounds as shown. *John Hutchins Cady (1881-1967) was an architect, architectural historian, preservationist and urban planner. He served as the Rhode Island Preservation Officer from 1955-1960 and was a consultant on the Rhode Island State Planning Board Maps. He was the author of seven books on history of architecture and urban development of Providence and Rhode Island as well as author of numerous articles.